Dr. Xiong is an Assistant Professor at KSU. The Xiong lab focuses on understanding the mechanisms underlying aging and neurodegenerative diseases, with specific emphasis on Parkinson’s disease (PD). 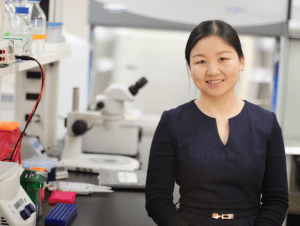 Dr. Xiong’s group aims to understand the molecular pathophysiology of PD using various model systems including yeast, Drosophila, mice, primary and human neuronal cultures. Prior to her current position, Dr. Xiong was trained as an APDA Fellow and a Michael J. Fox Foundation Rapid Response Innovation Awardee with Drs. Ted and Valina Dawson in the Institute for Cell Engineering and promoted to an Assistant Professor in the Department of Neurology at the Johns Hopkins University School of Medicine. She is currently an awardee of William N. & Bernice E. Bumpus Foundation Innovation Award and NIH/NIA K01 award. Mutations in LRRK2 are the most common genetic causes of Parkinson’s disease (PD). But the mechanisms that regulate LRRK2 function remain unclear. The LRRK2 protein includes two important enzymatic domains: a GTPase domain and a kinase domain. It is unclear how the GTPase and kinase activities regulate LRRK2 functions in vivo. It is believed that aging is the greatest risk factor for the development of Parkinson’s disease. However, how normal aging interacts with genetic factors to contribute to PD is poorly understood. The objective of this proposal is to investigate how aging affects LRRK2 enzymatic activities in vivo. To this end, we have successfully developed a novel LRRK2 mouse aging model with improved and progressive DA neuron degeneration and accompanying behavioral deficits with aging. Using this LRRK2 mouse model, we will functionally analyze LRRK2 kinase and GTPase activities in vivo with aging. Given strong genetic links of LRRK2, it represents a clear and compelling target for therapeutic development for PD. Understand LRRK2 enzymatic function with aging will provide novel insight into molecular mechanisms associated with PD.